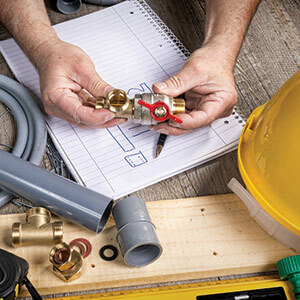 Double Diamond Plumbing has been your local professional contractor for plumbing, heating, air conditioning, sewer systems and more since 1993. We provide installation, maintenance, cleaning and repair services to both residential and commercial properties throughout Grand Junction CO. Your heating, cooling, plumbing and sewer units are by far some of the most important features of your home. That’s why it’s important to keep them well maintained to prevent breakdowns, and to ensure you’re investing in quality repair services when they do. So, if you’re looking for air conditioning, heating and plumbing in Grand Junction CO, Double Diamond Plumbing has it all. We have over 20 years of experience in the business, and our portfolio includes new construction, remodeling and renovation projects of all types and sizes for both residential and commercial properties. We provide service throughout Grand Junction CO.
Our specialties include plumbing, A/C and heating repair. For more than 20 years, we’ve been your leading local contractor.